The last day was both exhausting (hence no post) and exhilarating. 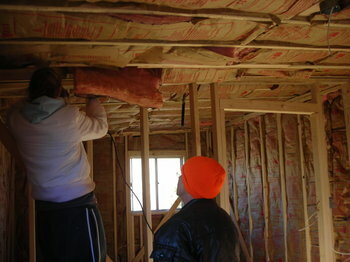 We had only two jobs - to stucco the outside of the house and hang the drywall. 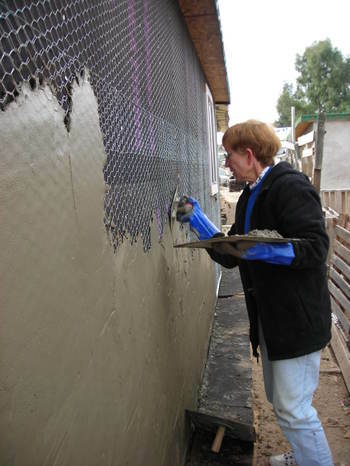 Stucco is made of cement, sand, and water. We had plenty of cement and plenty of sand; however, we had no water. The pipes had frozen over night. We had hoped to finish by noon but as we stared at the waterless hose, we realized those hopes were over. The guys set off in the van with a large drum to look for water. A few, who knew what they were doing, started the drywall. The rest of us stood around hoping the weather would warm. About an hour later, it did. The water flowed and the guys returned with a full drum. Now we had more than enough water. Stuccoing is hard work. It is supposed to stick to the chicken wire but as we pushed the stucco onto the wall, more would fall off than stick. I finally got the hang of it but it was slow going. My arm ached and finally became too weak to push the stucco any higher. The drywall was the last thing to be finished and was slowed by a missing piece. The four working on the drywall has to be creative and fit the pieces together like a puzzle. And beside you to be your friend and companion on the journey. I’m grateful we took part in this build. It was an amazing experience. If I had had to build the house myself, I would have been overwhelmed but all I had to do was my part. I hammered this piece of wood to that piece of wood. I cut chick wire. I hammered more nails. I carried sand. 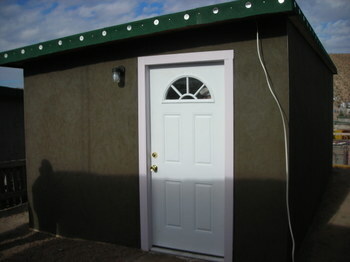 I put up stucco. I did my part and 20 other people (including the new owner, Juan, and our guide, Cody), did their part. Together we built a house for a family that until yesterday lived in a shack built of cardboard. Last night they slept in a house that had a concrete floor, a sturdy roof, and four insulated walls that kept them warm. I’m grateful for the small role I played in making that happen for Juan Jr., Susanna, and Juan III. Today started with an empty concrete slab and ended with what looks like a house. 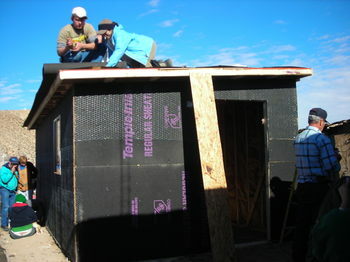 In an eight hour period we attached the frame to the slab, finished building the roof, put black board along the outside, insulated the walls and ceiling, stretched chicken wire along the entire outside, installed the windows, wired, and began hanging drywall. Tomorrow we will finish the drywall and stucco the outside of the house. We are hoping to be finished by 2:00 PM and if we are quick, noon. It was both thrilling and exhausting to watch the house take shape. I have hammered for hours and hours and hours. My forearms ache. I have bruises on both knees and well as on my shins. We are all a bit sunburned and wind burned. We hurt in new and interesting places. And we have been cold. Fortunately, the sun came out today and the wind died down. It was much more pleasant to work and gave us the stamina to continue until 4:30 PM. But despite all our aches, our chapped lips, and our cold toes, I think we are all impressed and excited by our progress. I have watched the family walk in and out of their current cardboard home. I cannot imagine how their current home withstands the winds, the rain, or the blazing hot summer sun. I cannot imagine living in such a place. 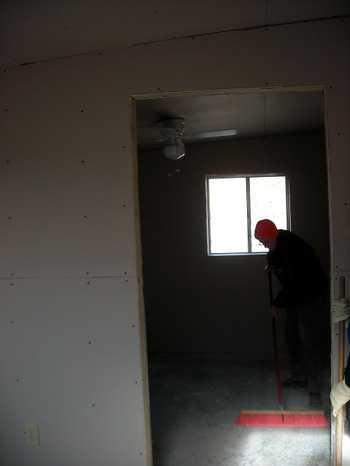 The house we are building is tiny but it has insulated walls, a concrete floor, and a ceiling that will not leak. We are giving the family a space heater tomorrow so their little home will be warm and dry and cooler in the summer. Most homes in my area boast three bedrooms, a rebuilt kitchen, a living room, study, dining room, basement and two to three bedrooms. This house will have two rooms and neither of them are a bathroom. It will not have running water. They will cook, eat, sleep, and sit in just two rooms. It’s humbling. As I erect their two room home, I am once again struck by the outrages excess of our country and my lifestyle. I do not have answers nor do I suspect I will make any substantial changes to my lifestyle. But I am thankful for the reminder and maybe the next time I complain about the bathroom window blinds that don’t quite match, I’ll stop and remember a tiny two room house in Juarez and worry a little less. This morning, nineteen of us gathered at my home church in El Paso, TX. We piled into two vans and drove across the boarder into Juarez, Mexico. We wound our way through the busy streets until finally turning onto a dirt road that snaked up the side of a mountain. 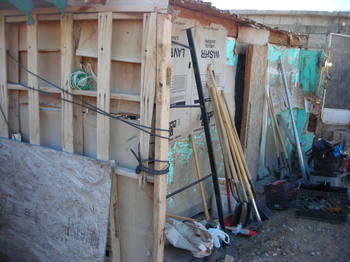 We came to a stop in a neighborhood of homes built of concrete, wooden pallets, and cardboard. 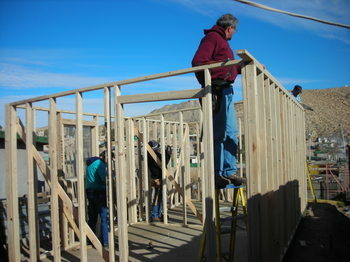 We are building an 11 x 22 home for a family of three (mother, father, and 2 year old boy). They currently live in a house built of cardboard. 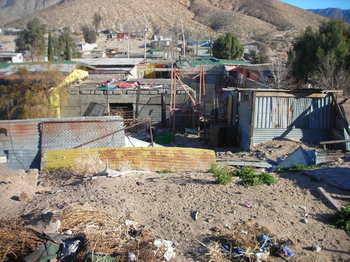 Casas por Cristo has built over 2600 homes in Juarez so they have the build down to a science. 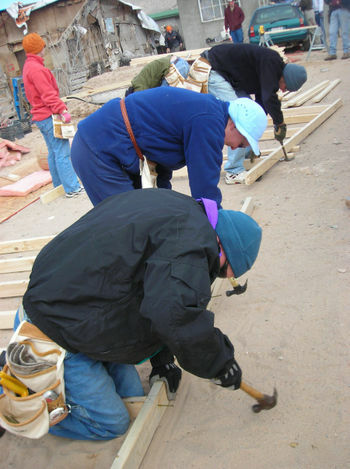 Part of the group leveled the ground and built the frame for the concrete slab. I helped cut chicken wire for the plaster that will eventually cover the walls. Others cut boards and insulation. 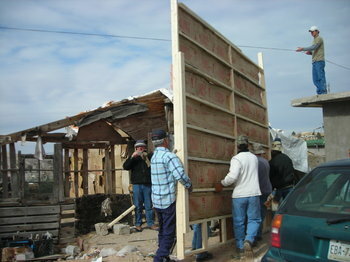 After enough boards were cut, we began to assemble walls. 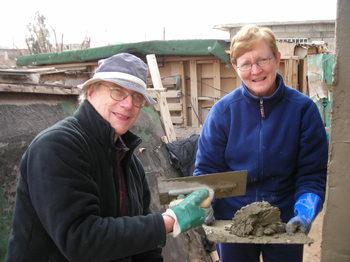 When we left the worksite at 3:00 PM, we had poured the concrete slab, prepared all the materials, and assembled all four walls as well as the ceiling. Tomorrow we will put the walls up, wire the home, attach the ceiling and begin plastering. Saturday the home will be finished. It has been incredible to watch the house skeleton take shape. My hammering has improved greatly but I expect undiscovered and unused muscles to begin their griping tomorrow morning. Today would have been a lovely experience, had it not been for the wind. Because the weather was supposed to be in the 50s all week, I did not pack my warmest winter clothes. But I had forgotten about the desert wind. That was a mistake. For most of the day, I was miserable as the wind whipped up the sand and burned my face. 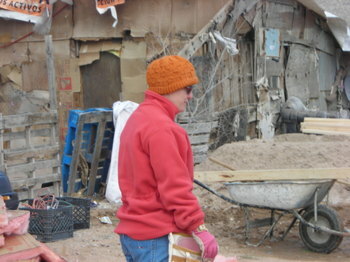 We were all covered in sand and shivering as the wind chill dropped lower and lower. By mid morning, I had borrowed a coral fleece, an orange hat (which both looked lovely with my hot pink work gloves) and finally a green windbreaker. All of this covered a long sleeve shirt, a T-shirt, a sweatshirt and old baggy jeans. 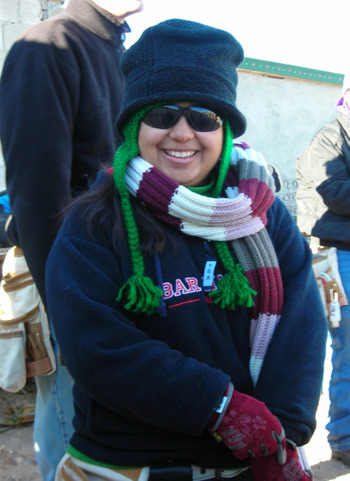 Even still I was cold and looking forward to quitting time. I’m hopeful the wind will have died down by tomorrow morning. I also look forward to erecting the walls and watching as this tiny home prepares itself for a family. I am insanely unapologetically proud of my mother's work and grateful that I had a hand in bringing these beautiful creations to Our Big Steeple. I'd like to have them posted in one place at one time because it is the only way I'll ever see them all together. 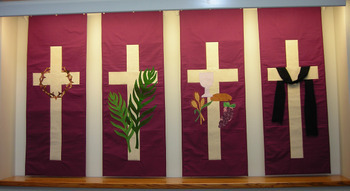 Most are now hanging in our banner closet. These banners, which cost Our Big Steeple $4000.00, are paying for the house we will begin building tomorrow morning at 8:00 AM MST. I believe that makes this tiny home we are building my mother's labor of love. She put hours of work and creativity and time into the banners only to turn around and place all the money on a home which she will again put hours of work and time and love into building. I hope one day I'll learn to be just a smidgen as good as my mother. 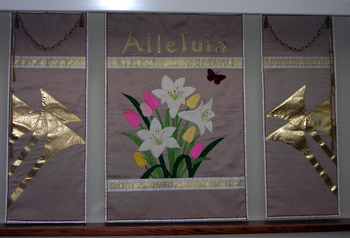 She actually made two more but I cannot post them, as they say the name of Our Big Steeple. 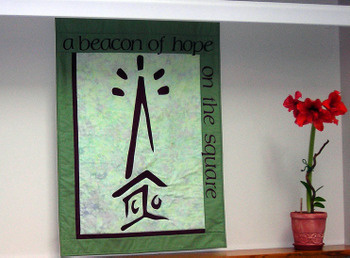 By the way, the ordinary time banner reflects Our Big Steeples logo. 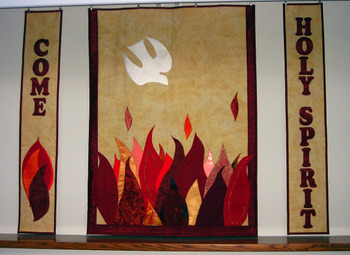 The final installment of banners. These are my favorite. My mother also made me a stole to match. I just loving having such a crafty mother! Blessings to all of you. 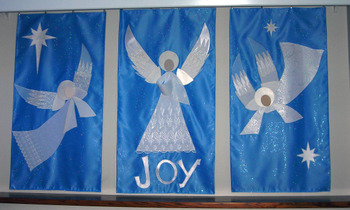 I pray your Christmas day is filled with joy, good food, and rest. A year and a half ago, my mother called to say that she planned to take the entire family to Peru. This was to be her 60th Birthday present to herself. Her birthday was this past August, so she thought we might take our big trip in September or October. We'd visit the Amazon forest and Lake Titicaca (which makes me giggle because I'm 14). A few months later she called to say we were not going to Peru because it was too expensive (uh...yay!). Instead, we were going to Hawaii. We'd rent a house, go to the beach, hike to volcanoes, and ocean kayak. A few months later she called to say we were not going to Hawaii. Maybe Lake Tahoe. Its beautiful there, so she said. A few months later she called to say that we weren't going to Lake Tahoe either. Nope. Instead, she was going to fly us all home to El Paso, TX (not too exotic when you grew up there!) the week after Christmas. 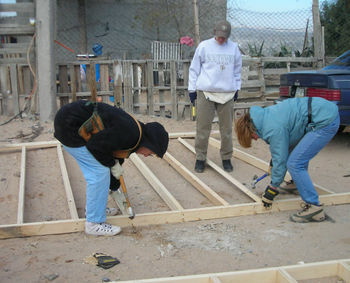 Once there, we'd spend three days building a house for a family in Juarez, Mexico, which is just across the boarder. So - that's what Dr. Burg and I will be doing this Christmas. Tomorrow we will drive to West Virginia for a night with his family. On the 26th, we'll drive to BWI and then fly home for a week in the sunny city. There are 19 of us gathering for the build - my parents, my youngest brother, Won't, my middle brother, Smartpants, my sister-in-law, Shortpants, Dr. Burg, myself, and a number of people from my home church, including two childhood church friends. We should be able to build the house, from the ground up (we are even pouring the concrete), in three days. 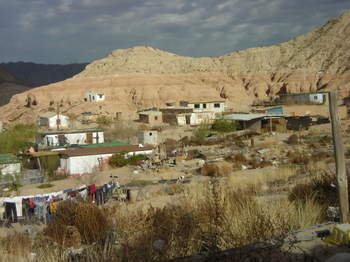 We are working through the organization, Casas por Cristo, so they know what they are doing, even if we don't. My mother (because she is a better person than me) decided that instead of spending money on ourselves, we should do something for someone else. 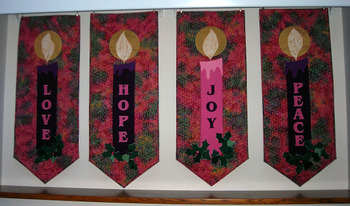 She used the $4000.00 Our Big Steeple gave her for the banners (next time she needs to charge more!) to pay for the house and then paid for all our plane tickets. I'll post pictures and highlights from the build, if I haven't destroyed one of my fingers with a hammer or killed a family member. This much togetherness may be too much! So, its not quite Peru, but in the end this might be the bigger adventure. It will certainly be more meaningful. This evening as Dr. Burg and I dressed for the neighborhood Christmas party, we found ourselves quoting from David Sedaris' short story, "Six to Eight Black Men." I first heard the story on Sedaris' CD, Live at Carnegie Hall. We both thought it was hilarious and obviously still quote it around the holidays. I've included a youtube video of Sedaris reading the story. The video isn't much so turn it on and do other things. By the way, this is his explanation of Cinder Klaus, so its in keeping with the season. For those of you that do not know football, Jo Paterno is the 81 year-old coach of the Penn State football team. He's been coaching the team since 1966. Both my grandfather and father are alums. My grandfather, at almost 94, is also the oldest living member of the Blue Band. He kept his tuba so for years my brothers and I would send deep guttural roars up from the basement where the tuba was stored. Needless to say, my grandfather and father are HUGE Penn State fans. By default, the rest of us were also fans. Until....I married Dr. Burg. He is a West Virginia University alum, therefore, his upbringing included a deep hatred for my father's alma mater. Now what is a girl to do? I suppose I could have remained loyal to my alma mater, Texas Tech but lets face it, I was never a huge fan. I'm not really much of a football fan to begin with so it's simply easier to cheer for West Virginia. Living in my house means one will watch WVU games and hear important updates on coaching, new plays, players, recruiting, etc, so I might as well be a fan even if only half-hearted. Anyway, there is much to-do about Joe Paterno. Many say he is too old to be coaching. That's probably true. It hard to imagine that he's as fresh and as on top of things as he was 30 years ago (the guys been there 41 years!). Others say he IS Penn State and he should be allowed to coach as long as he wants. I don't have a strong opinion one way or the other. I will tell you this, however, if I am still happy and healthy and interested in what I'm doing at 81 years old, I'll keep on doing it too, whether its sky diving, dancing, gardening, reading, or even working (I seriously doubt I'll be working at 81 - I plan to retire in exactly 30 years - sooner if possible). Sometimes doing what you love will keep you young - even coaching football. So here's to Joe and many more healthy happy years - doing whatever it is that gives him life. I think I'm ready for what is ahead, whatever that might be and whenever that might come. I think and hope that some newness is brewing (in response to the restless, listless, & ready feelings) but I'm not sure what it is yet. No, its not a baby. I am thinking of a birthing but not a literal birthing. I'm hoping I may be fortunate enough to birth some other newness. Maybe in my 35th year. It seems like a good year for birthing. But maybe that's just my opinion. I suppose the Spirit would need to agree.